Find natural relief from daily stresses with CBD (hemp) Oil. CBD (Hemp) oil is rich in naturally occurring molecules, and is packed with Amino Acids, Vitamins B1, B2 and D, Omega-3 and Omega-6 Fatty Acids. Start your day off right with a cup of the CBD infused coffees and put balance back in your day! Focus is perfect to introduce yourself to this amazing line of specialty blend coffees! This blend has 1.25mg CBD per serving, just enough CBD to help calm those coffee jitters, provide some focuse, and alleviate minor aches and pains for some. 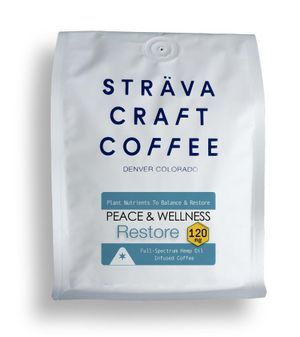 Escape is Strava's decaffeniated coffee that is infused with 2.5mg of CBD per serving. This blend is best for those who like to enjoy a cup of coffee after dinner or throughout the evenings. Escape has just enough CBD to help calm and relax for a peaceful night. Restore is the most popular of their CBD infused coffee blends with 5mg of CBD per serving. This amount of CBD per serving is just the right amount to provide the many therapeutic benefits of CBD as well as enjoy the taste of this amazing coffee!